Three people were killed when two vehicles collided in Medford. 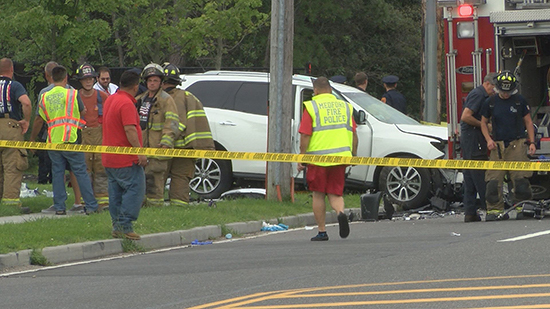 MEDFORD, Long Island (WABC) -- Police say three people were killed in a two-vehicle crash on Long Island Monday afternoon. According to Suffolk County Police, Dominick Lopez was driving his 1995 red Honda Civic south on Station Road in Medford at about 4:25 p.m. when Lopez apparently lost control of his vehicle, crossing the double yellow line and colliding with a northbound 2016 Nissan Pathfinder. Lopez, 20, of Shirley, and his passenger, Derek Buffa, 23, of Mastic Beach, were ejected from the vehicle and pronounced dead at the scene. A rear seat passenger in the Nissan, Aida Cardenas, 67, of, Selden, was pronounced dead at Brookhaven Memorial Hospital Medical Center. The driver of the Pathfinder, a 41-year-old-man, and his 33-year-old wife, both of Bellport, who was sitting in the front passenger seat, were hospitalized with non-life-threatening injuries. The couple's 11-year-old son and 1-year-old-son were also treated for non-life-threatening injuries.